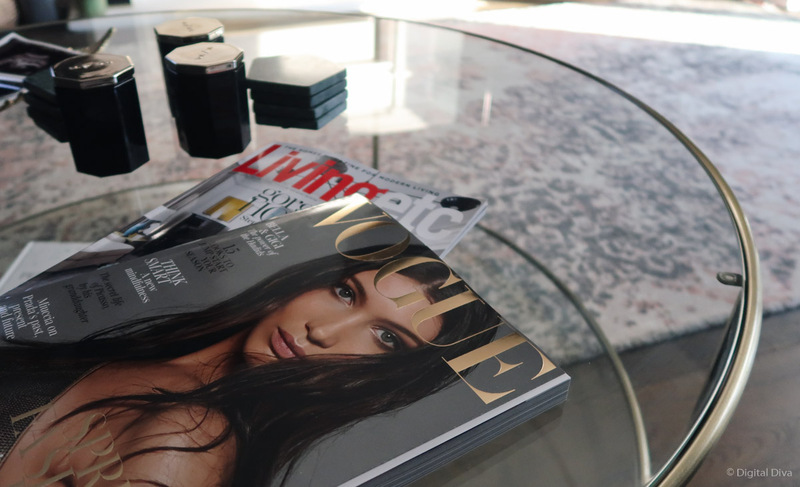 A great round coffee table is hard to find…well, at least I think it is! We started thinking of adding a bit more of our personality into the living room at the end of last year. 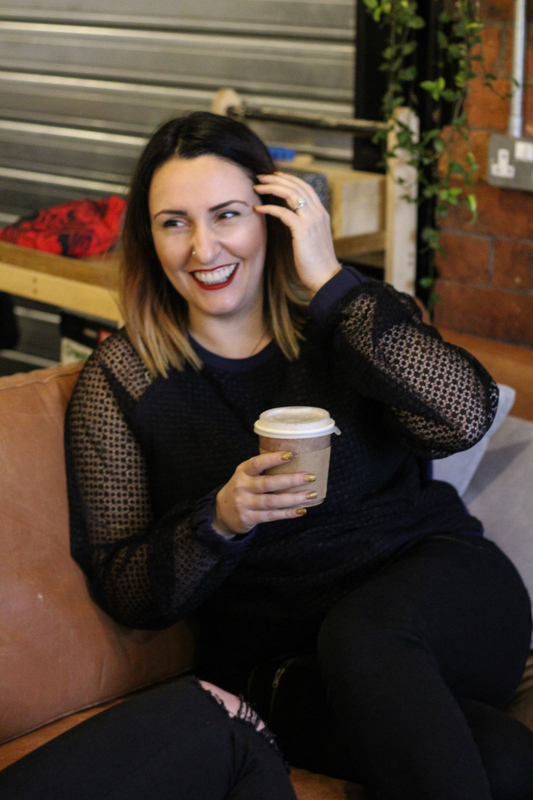 We did what we usually do when we’re can’t quite decide which direction to take…we asked Karen from Making Spaces to come over and help us get our thoughts together and help give us some inspiration in terms of the right items. Karen is bloody amazing at that, she gave us exactly what we needed to set up off on our journey of figuring out what we wanted to do. I’ll go into all of that another time (including the journey we went on to get to the wall colour we finally chose). It’s Valspar’s Caviar….and looks a very dark green in this light, but it’s actually a bluey-green off-black. Is that a colour? I’m making it a colour…sometimes it looks black, sometimes a dark navy…and in photos during the day, apparently a dark green. I love the kind of paint that changes in the light and am really happy with the feel of the room now. But yes, I’ll go into all of that in another post…. 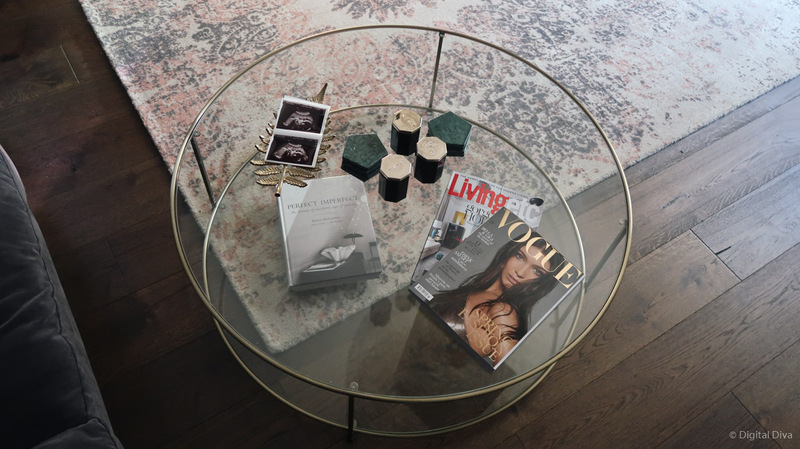 …this one is all about this gorgeous round coffee table from La Redoute. Karen pinned a few coffee tables (and mirrors, rugs etc.) that she thought might go with the style we wanted and I fell in love with this one. I knew I wanted a circular coffee table, as quite a lot of the items in the room are rectangular or square (fireplace, TV, rug…etc.) – a round coffee table was really needed to balance out the shapes. 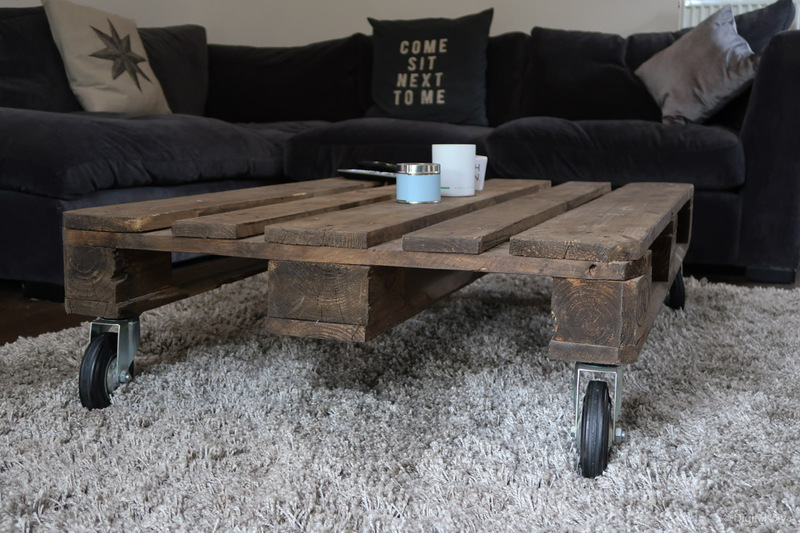 Our previous coffee table was one that James made from a pallet. We did love it, but we’d had it a few years…more people seemed to be doing them now, so is less unique and it wasn’t always the most practical (many minutes spent searching for my keys, when they’d fallen through the slats). 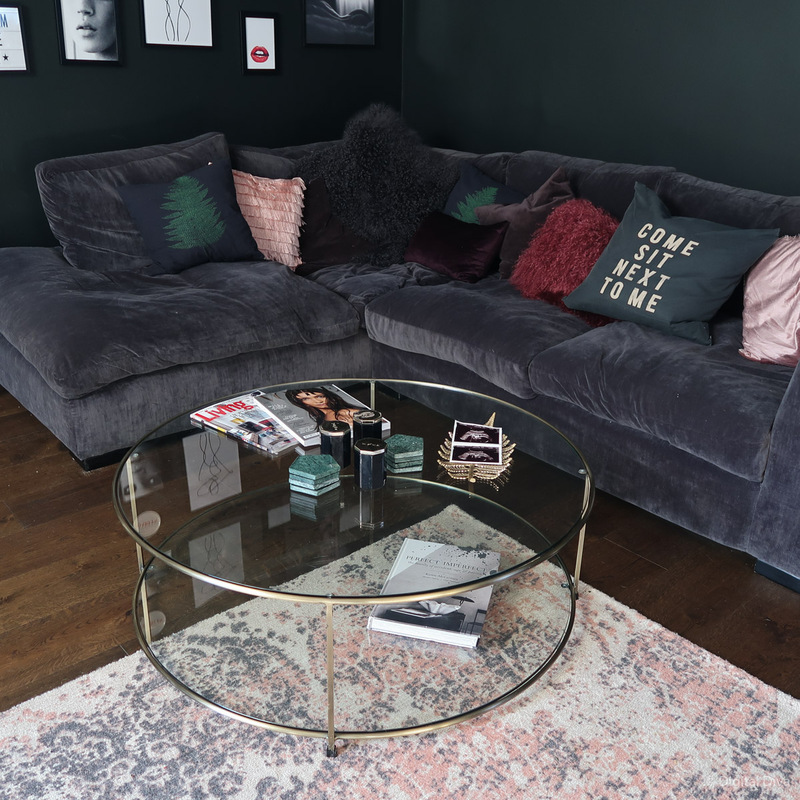 The trouble came when we finally started to order the items we’d chosen from Karen’s picks and our own research… the round coffee table was out of stock at La Redoute. Nooooooooooo……! OK, I figured I could find something similar. I found some which fulfilled my ✔ gold ✔ round ✔ glass tick boxes (with the help of a fab friend who also lent a hand one evening searching with me)…ones we looked at included the Aula from Made.com, the Andrew from Wayfair and the Coco from Rose & Grey. But I loved none of them as much as the La Redoute one. 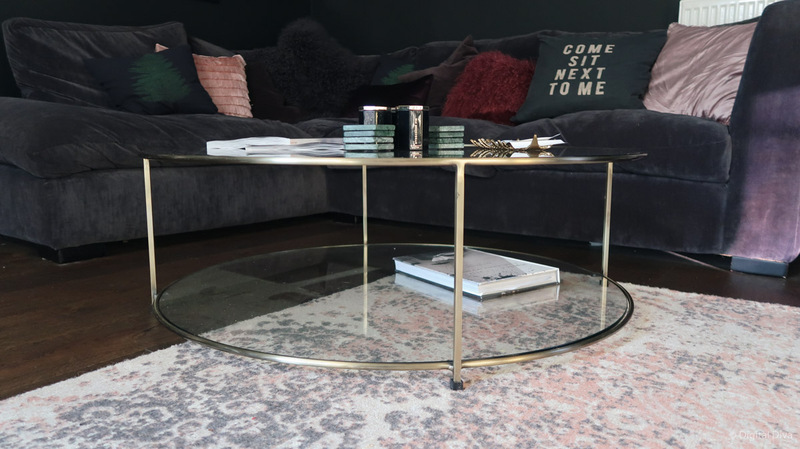 I loved the thin minimal gold frame of the La Redoute round coffee table (there’s also a black version). It didn’t seem to demand attention like some others do? We’ve got so many points of focus in the room, I didn’t want the table to fight with that. I wanted a thin gold frame with glass, so it blended in more elegantly…rather than make a statement. Fortunately, during an evening continuing my fruitless search for an alternative, I checked the La Redoute website for what felt like the 70th time and it had come back in stock. Hallejuya! I’ve never bought anything quite so fast…my debit card was startled. Around a week later, it arrived…settled itself nicely in our living room and I’d just been waiting to get the room sorted a bit more to take these photos and tell you a bit more about it. We’ve still got a bit left to do in the living room…the gallery wall is done (more on that to come), but the bare wall next to it really needs a big piece of art that we’re nowhere deciding on. We’ll get there. I’ll share when we’ve found it.